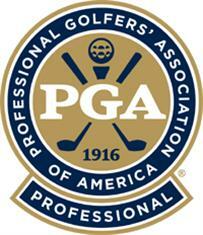 Richard is a PGA “Class A” Member and was previously named one of the Best Teachers in DFW, by Texas Golfer Magazine. 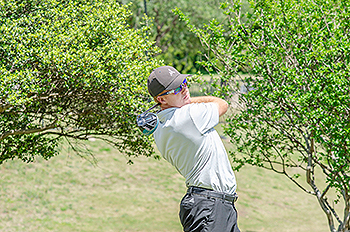 Originally from Royal Lytham & St. Annes Golf Club in England, he attended Texas Wesleyan University in Fort Worth, TX. After graduation, he worked at Oakmont Country Club in Pittsburgh, PA for five years. Some of his notable experiences include winning the 1995 NAIA National Championship at TWU and caddying for Tiger Woods in the 1996 British Open. He has over 30 years of playing experience and has been teaching the game for over twenty years. Richard works with players of all ages and abilities by simplifying the game, focusing on solid fundamentals, and customizing a teaching program for the student. He has over 20 years of club fitting experience using all the latest technology including V1 video, Foresight Sports Quad Technology and is a Mizuno Certified Club Fitter. Whenever I ask a student to aim at a target they focus on their feet and neglect their shoulders. For consistent alignment get your shoulders parallel to your target line. So when you align yourself from now on make sure that your eyes are focused on your target and not looking down at your feet. It’s like shooting a basketball; your eyes are on the basket. Too often I see players set up to the ball and spend the majority of their time looking at the ball and their feet and barely glance at their target. To shave shots off your score, look at your target and glance at your ball when taking your address position. You’ll be amazed how this will free you up and help you play better golf. I’ll always ask a student when I give a putting lesson, “When was the last time you lost a ball on the putting green”. They will say “Never”. Then I will ask, “Why do you lift your head up to see where the ball has gone?” If you ever watch Tiger or Annika putt, you’ll never see them move their head until the ball is almost to the hole. To make more birdies try practicing hitting putts by placing your golf ball on top of a coin like a quarter. After you hit the putt, ask yourself if the coin is ‘heads’ or ‘tails’. The length of time that it takes for your eyes to focus on the coin is about the length of time that you need to look down before you look at the hole. Do you ever feel like that you just can’t slow your swing down? A lot of times I will see golfers trying to swing quicker in order to hit it farther. Just remember that the two biggest inhibitors of distance are tension and not completing your back swing. Tension comes from gripping the club too tightly resulting in a jerky takeaway and then ‘hitting from the top’ in an effort to generate power. Next time you practice, place a golf ball directly behind your club head and pretend that it is an egg. When you start your takeaway try to roll the egg away without breaking it. 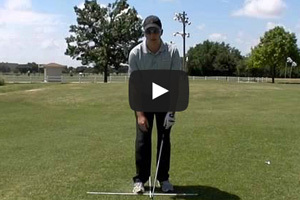 This will help you feel a smooth tempo while adding more power and distance. There is a lot of confusion amongst amateurs as to what is the difference between a driver swing and a regular iron swing. The answer is that the swing itself is the same, just the angle of attack is different. When you hit an iron you are looking for a downward blow that takes the ball then the divot. With a driver you want to sweep the ball off the tee and the minor adjustment is placing the ball forward in the stance towards the left heel, this promotes the sweep. When you practice your driver on the range I would recommend not to hit more than five drives and then grab a wedge and hit a few pitches. This will help you keep good rhythm and tempo rather than blazing away with drive after drive. Think about it, in a round of golf you’ll hit no more than 14 drives usually about 20 – 30 minutes apart, so when you practice keep this in mind. Try hitting 5 shots with the same club and then change to a different club and different target. This will keep you fresh & more focused. There is nothing more destructive in a round of golf than a quick hook. As Lee Trevino says “you can talk to a fade but a hook won’t listen!” Of course we all like to hit a powerful draw but if you are hooking the ball and can’t fix it then here are some thoughts. When a golfer hooks the ball, the strong impulse is to swing more and more right of the target (inside-out), which is like adding fuel to the fire. The answer is to develop a “straighter” swing path, one that’s less out to the right, and more across. It will literally feel like you are coming over the top. If the golf ball is going left, only a more left swing path will straighten it out. Remember that golf is usually a game of opposites when it comes to feel! Crazy game!! The key to swinging more left and correcting that inside-out path is to feel the upper body begin opening as you start the downswing. The right side should stay high and come OUT toward the golf ball. I doubt very much that this will actually happen, but you need to feel like it is. The lower body will not, in and of itself, correct your swing path. In fact, focusing on opening the lower body often leads to dropping the club more inside, which we definitely don’t want. If you can feel like you “open up” early with your chest, the arms may very well stay UP longer, thus forcing the club on a better path into the golf ball. Here is one drill that you can try: Hit golf balls on a downhill lie, and feel like you are swinging very steep, down and left through impact. If you come too far from the inside, or “underneath” the ball, you’ll hit the ground first. Focus on making solid contact, and this feeling may fix your hook. Whenever I ask a student to tell me what their target is, I might hear ‘the fairway’ or ‘the green’. Think like a marksman shooting at a target. They will look at the bulls eye, not the whole target itself. So the next time you pick a target be very precise. On a tee shot, you might pick out a tree or even a leaf on that tree! If a building happens to be on the horizon in line with your target go ahead and pick a window! You’ll be amazed if you narrow your target of focus you might not hit your target every time but you will hit the big target a lot more often. Have you ever noticed how people practice their putting before they go to the first tee. Most of the time I see golfers pick the hardest putt on the green, for example a downhill 10 ft putt breaking about 2 feet to the right. The odds of making this putt are very low indeed and all you are doing is ingraining negative images when it misses the hole. Instead take 3 balls and hit putts that are 20 ft in length or greater and focus on speed. If they miss don’t worry, just focus on speed. Next hit putts that you cannot miss for example 2ft straight up hill. Do both of these drills 10 times for a total of 30 putts each. When you walk to the first green you will remember the 30 putts you just made and feel confident with your stroke. 1. Grip – Take your normal grip with your left hand only. Raise the club six inches off the ground, keeping only your forefinger on the grip. If you cannot do this then this proves that you are holding the club too much in your palm and not in your fingers. Grip pressure needs to be about a 4 on a scale of 1/10. Gripping the club too tightly will inhibit club head speed and the ability to release the club. 2. Posture – Imagine that your chin is resting on a table top at address. This will help you to keep your shoulders back and stand tall, not slouch! Focusing on these areas will make your practice time more productive and your playing time more enjoyable. Remember that the primary focus when practicing is to ingrain solid fundamentally sound habits. It is vital with all golf shots to have correct alignment so here is a simple drill to do every time you go to the practice tee. Take three golf clubs and place the first in front of the ball on the target line pointing at the target. Then place a second club parallel to the first approximately 1 foot from the first on the side where the player will hit from. Finally place the third club an equal distance on the opposite side of the first club which is also parallel. You can then pick up the first club and you will have your own alignment box setting you up parallel to every target that you aim at. This is one of the simplest and most effective practice routines you can do every day! In my opinion the best practice device when working on your golf swing is simply a mirror. The best players in the world will put in countless hours in front of a mirror whenever working on swing changes or just ingraining the feel of perfect posture and a golf swing. Remember that 99 % of the time spent playing golf is without the supervision of an instructor so when you work with a mirror you have your very own swing analyzer! Good posture and a solid golf swing will be ingrained if you spend just 10 minutes before and after every practice session. On the days that you are not able to play or practice, remember to spend at least 15 minutes in front of mirror at home. You’ll be amazed how much more consistent your overall golf game will become! Listen for the ball to drop I’ll always ask a student when I give a putting lesson, “When was the last time you lost a ball on the putting green”. They will say “Never”. Then I will ask, “Why do you lift your head up to see where the ball has gone?” If you ever watch Tiger or Annika putt, you’ll never see them move their head until the ball is almost to the hole. To make more birdies try practicing hitting putts by placing your golf ball on top of a coin like a quarter. After you hit the putt, ask yourself if the coin is ‘heads’ or ‘tails’. The length of time that it takes for your eyes to focus on the coin is about the length of time that you need to look down before you look at the hole. Missed short putts are often caused by turning the shoulders in a rotary motion (around the spine) instead of rocking up-and-down like a seesaw and creating a true pendulum action. Visualize a steel rod running through your shoulders and extending outward in both directions. As you make your stroke, pretend the rod is sliding up and down a flagstick in the cup. If you rotate the shoulders the rod moves away from the stick. Don’t worry about keeping the club head low to the ground because in a true pendulum stroke the putter head rises and falls with the shoulder motion. Remember: Left shoulder up for more putts in the cup. Just prior to starting your stroke, go ahead and hold your breath. This will help keep your body and head perfectly still which is vital for a consistent stroke. As you start the putter head back focus on a smooth, slow & natural motion. Keep the putter head low to the ground on the back swing and through swing. Swing firmly but smoothly through the ball, ensuring that the putter head never decelerates before impact. If you think about a constant speed back & through will help in eliminating the unmentionable “decal”. After striking the ball, keep the putter face moving along the initial line of the putt for a least three to six inches depending on the length of putt. When you play the ball slightly forward in your stance your eyes will be positioned further down the target line, or behind the ball which gives a better view of the ball and the hole. This ball position will give the clubface time to square up at impact and avoid pushing the putt offline. If you place the ball too far back in the stance this will promote a delofting of the putter at impact which causes the ball to jump and not to roll smoothly. On the other hand playing the ball too far forward will add loft and lift the ball into the air instead of rolling it smoothly. In both cases too far back or too far forward increase the chances of pulling or pushing the putt due to making contact too early or late as the putter travels along its path. Probably the most common misconception with beginners and intermediate players is the concept of having to hit down onto the ball to get the ball into the air. So many times I see players trying to scoop the ball into the air to help it get airborne. What results are some ugly shots, especially around the green? A simple and effective drill is to take a golf shaft or a yardstick and hold it next to the grip of your chipping club so that it extends out past the grip and beyond your hip. This will immediately groove the correct action of the wrists through the impact area and produce nice, crisply struck chips. When done correctly, the extended shaft or stick will stay in front of your left hip after impact. If you decide to scoop the chip shot, the extended shaft will give you an immediate reminder when it bumps your hip. 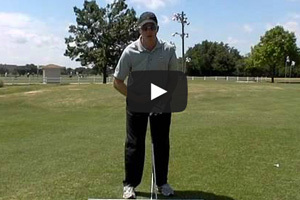 Try this drill next time you have any chipping woes. It will go a long way in helping your full swing shots as well. With good mechanics and a sound stroke, the sand shot can be one of the easiest recoveries in the game instead of one of the most feared. I personally use a weakened grip, and set up with the clubface and my body open to the target. Then I simply swing along my stance line and skip the club through the sand, keeping my left arm moving into a full, high finish position. 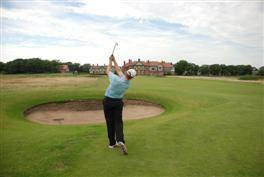 For a basic bunker shot, work your feet into the sand and open everything up – clubface, stance, hips & shoulders. Align your body about 30 degrees to the left with more weight favoring your left side, about 60/40. Then just swing your body where your body is aiming. By swinging left of the target and the clubface about 30 degrees open so that it is aimed right of the target, the ball goes straight to the hole. The open face allows you to use the bounce on the bottom of the sand wedge correctly and get the ball out. Don’t forget to accelerate through the shot to a balanced finish position and see the ball come out every time!! Many amateurs have trouble varying distance on bunker shots. Part of the problem is how they finish: They swing into a full follow-through regardless of the shot at hand. 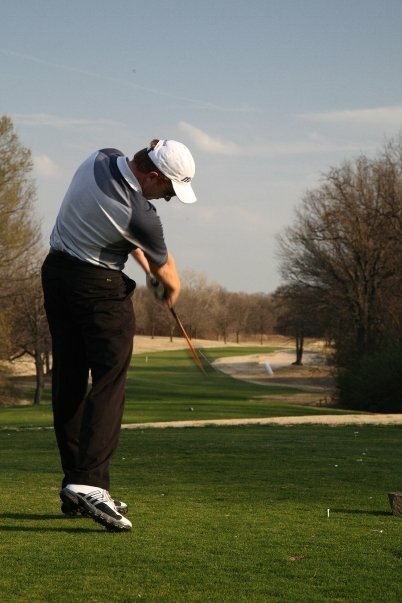 As a rule, the length of the follow-through should correspond to the length of the shot. A short shot needs a short follow-through, and a long shot needs a long follow-through. You wouldn’t finish with the club up over your shoulder on a short pitch shot; so don’t do it for a short bunker shot either. Match your finish to the shot you need. When I am faced with a bunker shot of 40 yards or more, which is regarded as one of the toughest shots in the game, I square up the blade, play the ball in the middle of my stance and swing a little harder, allowing my hands and the clubhead to release as they would do on an uphill shot. For very long bunker shots, let’s say over 40 yards, I would recommend using a pitching wedge or even a 9 or 8 iron, and just hitting an inch behind the ball. This is a shot that requires a lot of practice to get the feel and confidence but eventually you will relish the opportunity!! It is impossible to take the club away from the ball at a consistent pace if your grip is too tight. Unnecessary pressure transmits tension from the hands to the forearms and usually leads to a jerky takeaway. Experiment to see how lightly you can grip while still maintaining your hold on the club from address to the top of the back swing. How tightly should you hold your club? The answer is simple. I hold on just enough so that no tension creeps from my hands into my wrists. 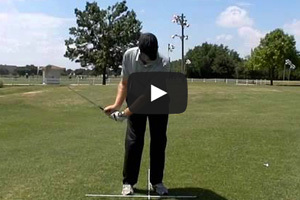 Hold a club up in front of you and make a figure eight with the club head. If you can so that smoothly, your wrists and hands are nicely relaxed, ready to begin the swing. Whether you are hitting a drive, putt or a chip your pre-shot routine needs to be the same every time no matter what the situation. If you watch the best players in the world you always see the same routine before they execute their shot. Next time you watch Tiger or Annika playing, count the number of seconds that elapse from when they set up to the ball and stop when they actually hit the ball. You will see that it is the same on the first tee as it is on the 72nd hole of a tournament. A consistent routine gives the player the optimum opportunity to execute the correct shot every time. Next time you get a chance to practice and work on your long game go ahead and find a fairway bunker or just an area of sand. Now this is not just to improve your long distance bunker play but it will help you improve your overall ball striking. Take a 5 iron and give yourself a good lie. Make full swings while keeping your lower body quiet. If you have any excess movement in your lower body or “fancy footwork” then you will hit the ball fat or thin every time. Focus on maintaining good posture throughout the swing and also at about 70% of your full power. By focusing on these points you will have less temptation to hit from the top and instead focus on a smooth transition and a solid strike. Next take your driver and tee the ball up while standing in the sand. Once again the focus is to swing with a quiet lower body and no more than 70% of your full power. After hitting around 25 – 30 shots go ahead and hit some balls on the grass while focusing on the same tempo your made in the sand. I guarantee this drill will help you with your timing, tempo and ball striking consistency on the course.